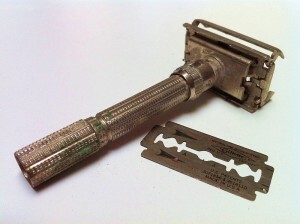 Is The Safety Razor Still Safe? I was thinking that I needed to try out the product called New-Skin Liquid Bandage. So I bit my lip and ripped off the gauze, cleaned my wound and sprayed this product over it. It burned like the dickens. However, it sealed up nicely and the pain is gone. More importantly, the wound is properly protected from germs and infection. I will definitely have one of these handy around the house for future emergencies. 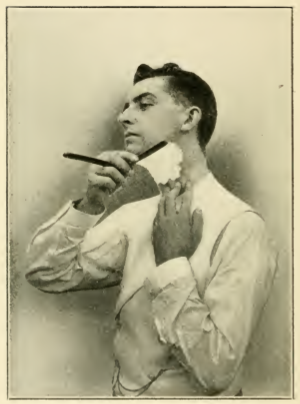 The first depicts a man shaving with a razor sharp blade directly on the neck with what is known as a straight razor. The second image shows a man shaving with the safety razor. When introduced in the mid 1800’s, the safety razor provided a shaving experience that was ‘safer’ than using a straight razor by exposing only a portion of the blade to the face. When comparing the two, it is fairly obvious to identify the shaving device that would be least likely to lead to cuts on the face at least upon first time use. 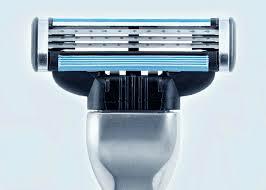 In this case, that is the device that is called the ‘safety’ razor. Now, compare the following images. Here, the first image is the safety razor. It is a device that requires the user to manually place a single razor blade into a razor handle and then properly shave with it. The second image is one of the Gillette Mach 3 cartridge razor. If you had never shaved before and were looking to use the option that was least likely to leave you with cuts all over your face, which would you choose? Would you choose the one with a single blade that is called the ‘safety’ razor or would you choose the version that has 3 blades and does not have the word safety in it? Recently, the safety razor has enjoyed a resurgence in popularity. I myself now use one and enjoy it immensely. It took significantly longer to learn how to use it in order to avoid nicks and cuts than any cartridge razor I used. What is interesting is that because of the new popularity, searching for things like ‘safest shaving’ or ‘safe shaving’ in a search engine will almost certainly have higher results than a cartridge razor. 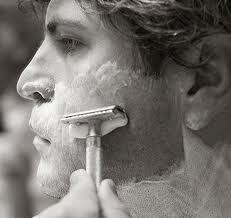 If a person happens to be looking for the safest shave method they might be misled. Apart from the steeper learning curve involve with the safety razor, it is less safe than cartridges in overall handling. One must manage to remove the blade from the paper wrapper and put it on the razor safely. After using the blade, one must throw the blade away. If the original paper is still around and is hasn’t been ruined by the natural moisture around during shaving, you might have some protection of the blade. But this really isn’t safer than how a cartridge would be handled. It typically is covered with plastic that can withstand moisture. Even if you lose the cap, a loose cartridge in the trash isn’t as dangerous as double edged blade. I think that there might be an opportunity for cartridge makers to rebrand their products in such a way as to make it clear that they are safer than safety razors. I enjoy chocolate. I enjoy chicken. When it comes to Hershey’s Kisses and chicken wings, I find that the level of effort involved to eat them isn’t quite worth it. I think that Hershey’s makes a fine chocolate, but for me, it is way too involved. The foil wrapping is so thin that it never comes off in one piece. I often end up with what looks like a pile of glitter after unwrapping. Unwrapping a single one wouldn’t be so bad, but really, who eats just one? The chocolate inside is fine, but not so great that I forget about the difficulty of the wrapping. 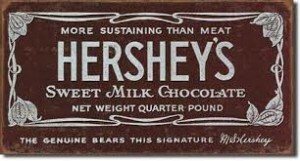 On a side note, I recently learned that an old slogan of Hershey’s was ‘More Sustaining Than Meat’. I found that somewhat comical. But could it be true? Maybe there is some merit to this statement if we compare it to chicken wings for sustenance. Like the Hershey’s Kiss, I find wings too much work for too little meat. To have even a single wing, a complete mess is made. I am not sure how much meat is on a wing, but it isn’t much. And only the professional wing eaters are good at getting everything off the bone. To make a meal of wings, you have to eat at least a dozen of them. When you look at a plate of ‘eaten’ wings, the plate is still a sizable looking portion of food unless you ‘ate the bones‘. The people who seem to really love wings are really in it for the sauce. 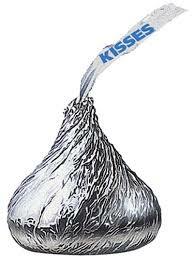 To those who love both Hershey’s Kisses and wings, please continue to enjoy them. For me though, the juice isn’t quite worth the squeeze. This year, we planted tulips in our flower beds. It was a fun thing to do in the autumn thinking about and planning for spring. Katherine helped me plant the bulbs and has been looking forward to them blooming for some time. It has been really fun watching them come up, and this week they really are looking pretty. Flowers are pretty amazing and quite interesting to study at close range. Last Sunday, we planned to attend a service of remembrance at the Elizabeth Blackwell Center’s Healing garden. Last year, after losing our daughter Evangeline, we were invited to the service to help families cope, grieve and most importantly for me, to remember and acknowledge their loss. I really liked the idea that in autumn, as plants are dying, we were planting bulbs that would bloom in the springtime. For me, it was a reminder that sometimes death can help us appreciate the beauty of life and that with my faith, death isn’t final. So, when it turned out that our daughters were sick with croup and the weather was pretty windy, we were sad that we couldn’t attend the ceremony. We decided instead that we would still have our own little private ceremony at home and planted bulbs all over our garden. Katherine was a huge help. She was really excited to get more ‘eyes’ or ‘eggs’ to put in the holes I dug ( her term for the bulbs). She also was very diligent in putting bone meal into the holes. I am glad that it turned out this way — I really enjoyed being able to do this at home and spend time reflecting. Next year, we will again try to go to the service since I find it is nice to talk about it among people who understand what we’ve been through and to be able to at least try to offer a sense of hope and encouragement to others. But I really liked doing this as well and think it will be a new tradition for our family. As we were finishing up our family trip in the Denver area, it was only fitting that we would be able to see some bikers participating in the USA Pro Challenge race finishing in downtown Denver. The previous day, we drove the Peak to Peak highway and periodically were slowed down by the race event, but it was sort of fun to be a part of it. It gave us a good excuse to stop for lunch in Nederland at The Savory Cafe. Not only was the food and service good, there were some musicians that stopped in to play. Normally, I really don’t like dealing with bands while eating, but this was just one guy on acoustic guitar and one on bass playing very enjoyable bluegrass. Since the girls loved it, I loved it. Katherine wanted to pose for a picture with the Herd of Bison sillhouette art in Denver on 16th street. We had just enjoyed a lovely dinner at Croc’s, an Ohio State restaurant and bar. While reminiscing during this Elvis week, I pulled out some old concert posters that had been given to me as a gift upon leaving my first post-collegiate job. My co-workers knew I was a huge Elvis Presley and impressed me greatly with these gifts. One of them is a poster advertising what would be Elvis’ last concert in Indianapolis, Indiana. The other was for a concert that never happened on August 12, 1977. Although Elvis didn’t die until August 16, 1977, he wasn’t able to make a few concerts after the one in Indianapolis. I love how that poster says to ‘Call Leah Rutan for Tickets’. A poster for an Elvis concert that never happened. It was just 4 days before his death. I wasn’t really sure what other concerts had been planned that never happened, so I started looking it up and found some pretty good information at Elvis Presley In Concert. While reading the article Feelings and Thoughts about 1977, there was mention about one of my favorite Elvis stories. The story was about how Elvis broke up a fight at a gas station in Madison, WI. There were two boys beating up on the son of the gas station owner and apparently Elvis saw this and directed the limo over so that he could assist by evening the odds of the fight. When the boys saw Elvis, who was still in a blue jumpsuit, the fight was over. Elvis didn’t leave until everyone had cooled off and shook hands. I never realized until reading about his 1977 tour just how ill he had been all year and yet this incident happened around a day before his last concert. As sick as he was, he still went out of his way to help folks like this. Impressive. Rebecca has been raving about Oxford Park in Upper Arlington lately. It is a very nice, small and usually non-crowded park, so it works well for her to take the girls. The other nice thing is that the equipment is challenging and exciting for Katherine, but is safe enough that she can play on her own for the most part. We took the girls there today — we had awesome park weather. I’d say they had fun. While walking back to my hotel after dinner last night in Denver, I saw a huge pack of bike riders, many of whom were in costume. As I found out later, the group was Denver Cruisers and the theme for the night was Fruits and Veggies. After taking this video, I saw perhaps the best costume. It was a biker that made a helmet that looked like some kind of animal made from a hollowed out watermelon. It even had watermelon ears. Great stuff. You never know what you will see in downtown Denver on any given evening.